SINGAPORE COMICS & COLLECTIBLES: WOLVERINE Vol. 5 #12 (2014) One Month To Die! 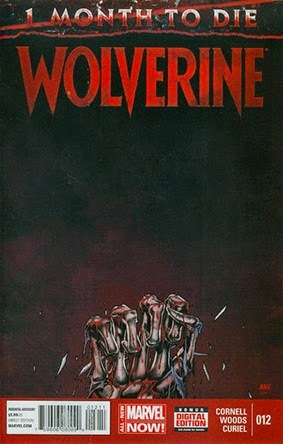 WOLVERINE Vol. 5 #12 (2014) One Month To Die! • PLOT SUMMARY: A DOUBLE-SIZED SERIES FINALE! Looks like Sabretooth is ready for his final showdown with Logan and he sure picked a meaningful venue. Didn't we just see a fight in a shopping mall that seriously scarred Logan? Oh, right. That whole 'messing with Wolverine' thing. Written by Paul Cornell. Art by Pete Woods. Cover by Steve McNiven. Plus: "That Which Didn't Happen" and "Guernica" by Paul Cornell and Salvador Larroca.